Currently there are two DevExpress vector skins and each of them has a set of unique color palettes. 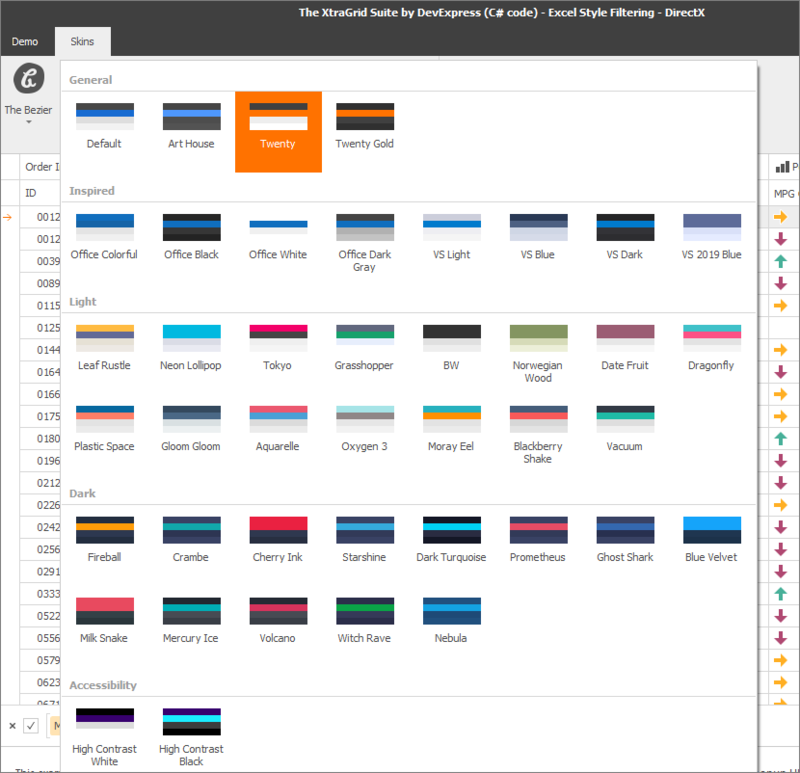 The Office 2019 Colorful skin ships with 7 palettes, the Bezier skin even has 42. To create a custom palette, you can run our Skin Editor and press F7. 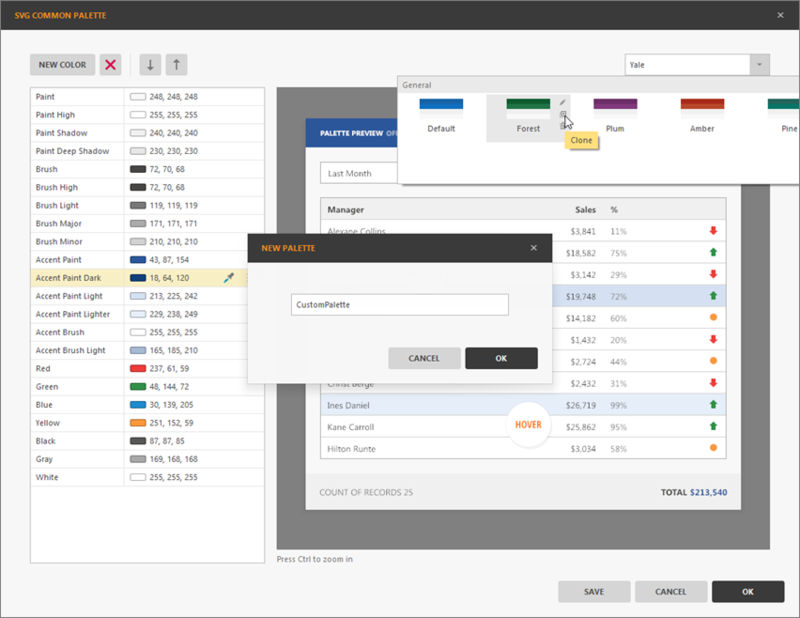 A dialog comes up where you can change individual colors for out-of-the-box palettes or create unique new ones. When you select a color from the list on the left, the preview highlights UI elements painted with this color. This feature allows you to find out how colors are used by the skin, and to easily see the difference between items, e.g. Brush Light and Brush High. To apply a palette created using the Skin Editor, you need to create an assembly and include it in your project. A second option is to add or modify palettes from code. 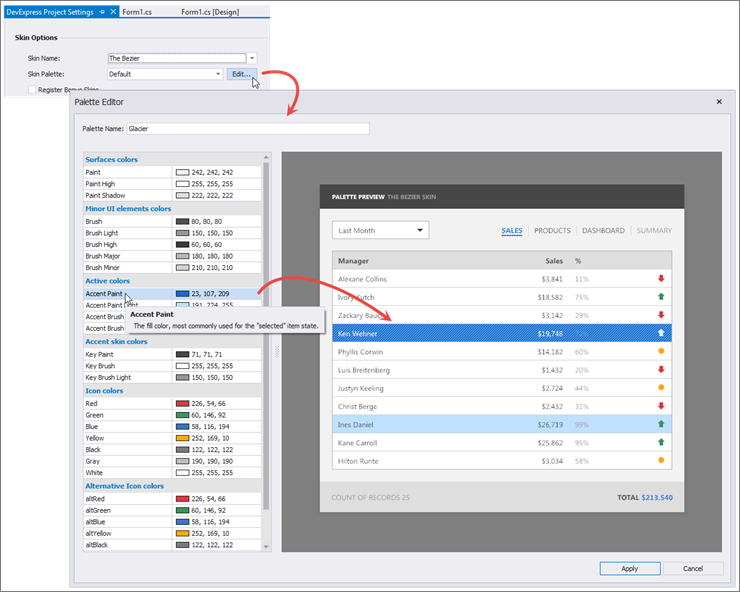 Using the code-based approach eliminates the requirement to have an extra assembly, but you don’t have visual feedback – only experienced users know exactly what each color does, and how to hard-code color values. 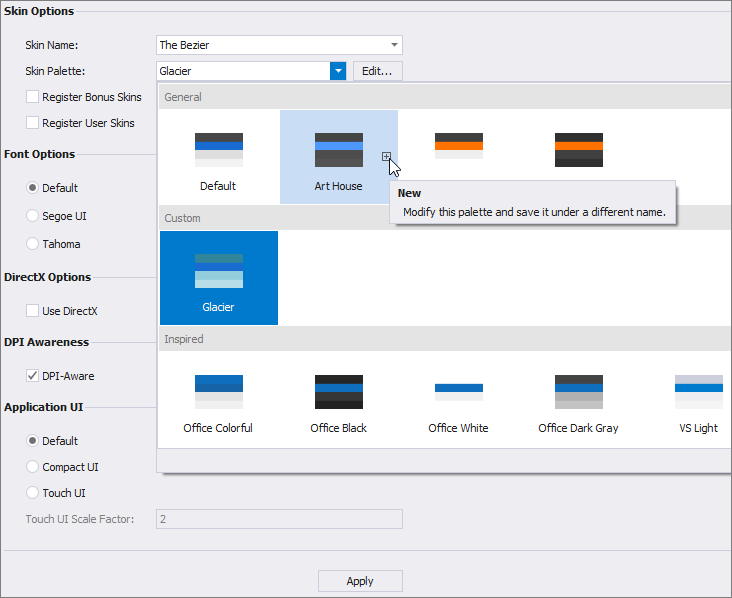 In version v19.1 we are adding the Visual Studio Palette Editor. Open the Project Settings page and click the Edit button next to the palette gallery. A dialog comes up similar to the one in the Skin Editor, including interactive preview and text hints which explain each color. You can also start from a standard palette that is close to your requirements, and then change some of the colors as needed. 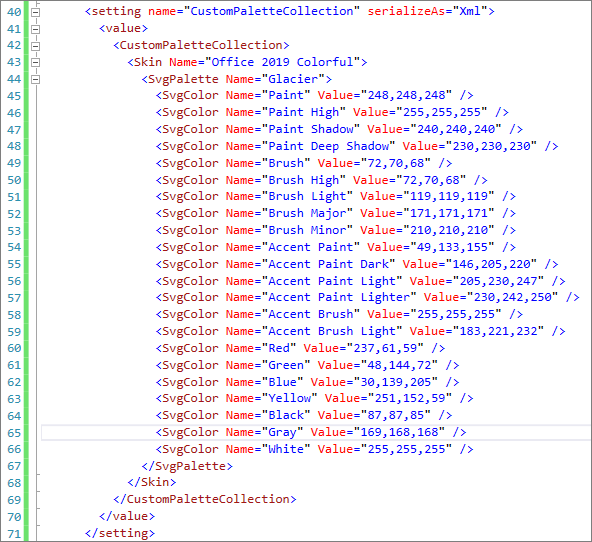 The important difference compared to the Skin Editor approach is that the Visual Studio Palette Editor saves your work to the App.config file in the project, in XML format. This makes it easy to maintain and share palette definitions without requiring an extra assembly reference. What do you think? Do you use custom palettes yet? Does the new editor make this decision easier for you? Is there a way to store those custom palettes in a seperate config file? I wish this dialog could be accessible by end-users so they can customize their own palettes if desired easily without me having to re-create a similar editor. 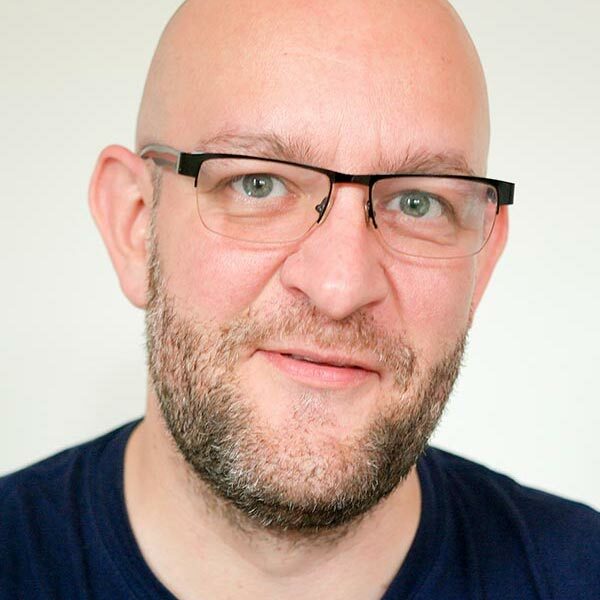 I agree with Christopher Jay, that would be a nice enduser feature! I'm using the "in code" approach to change one color of an existing pallete to match my product design, but have to make custom files for individual clients.